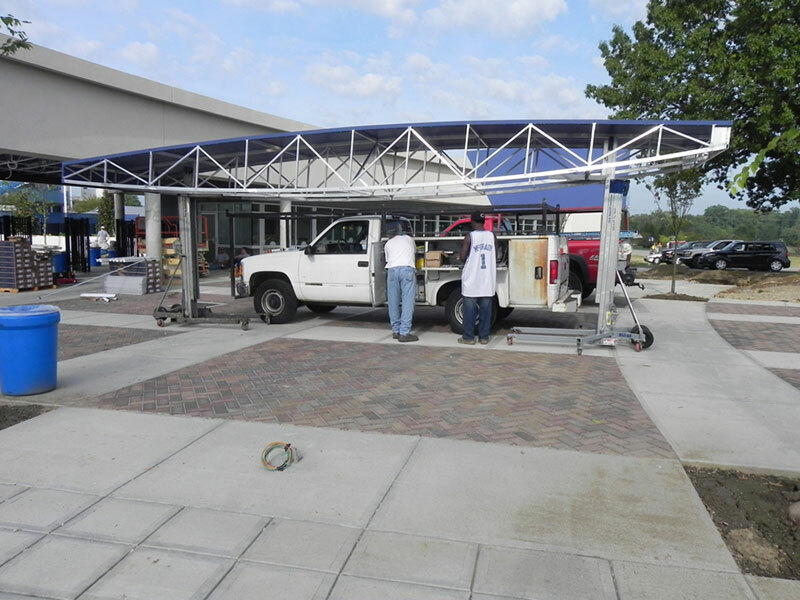 If an awning or canopy is going to be featured as a current project, it must have some special feature. 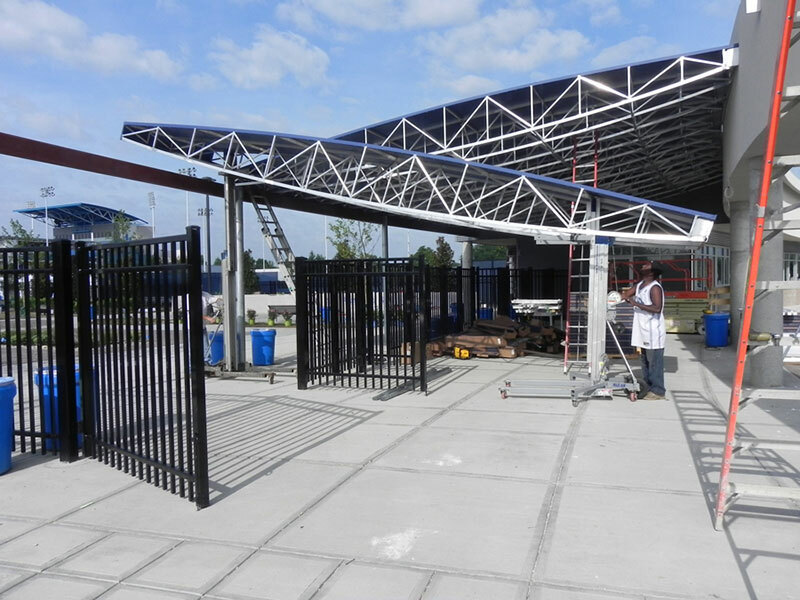 The three criteria are quantity, creative design and complexity of fabrication and installation. 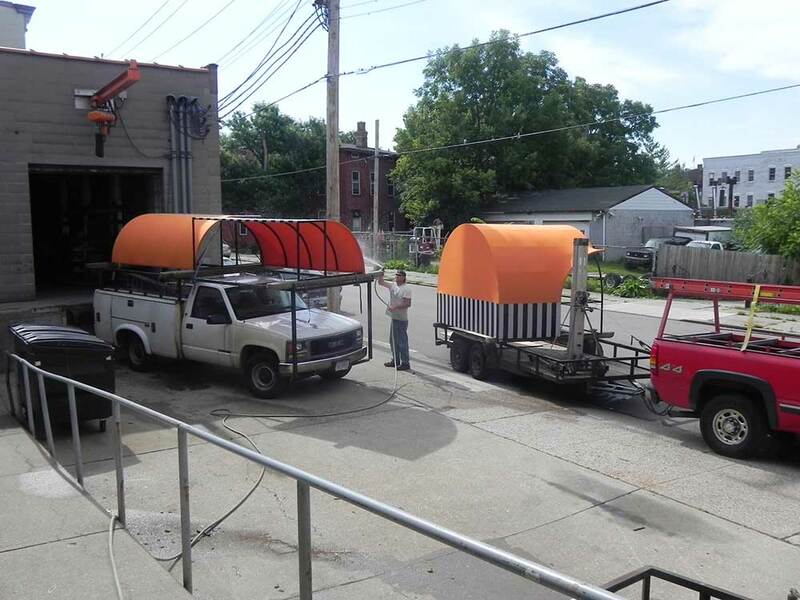 Most awning projects are similar in nature. 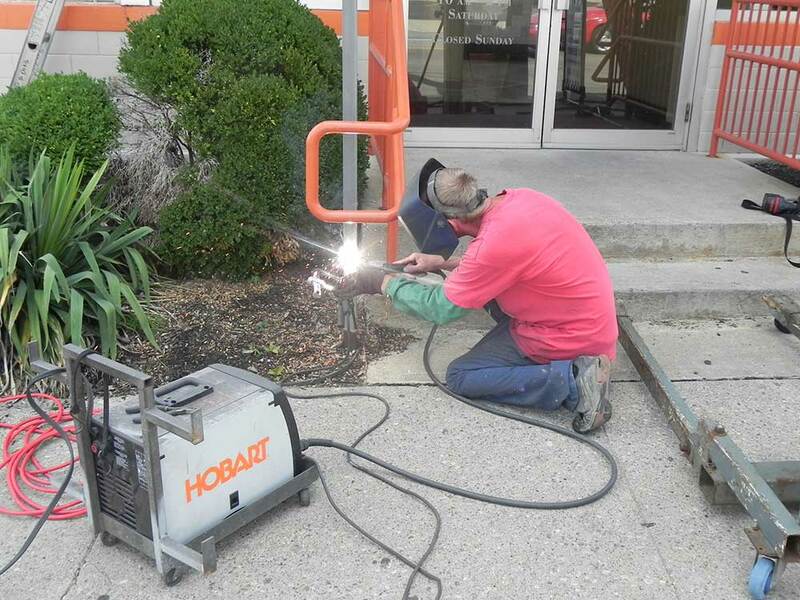 The dimensions and colors change, but the fabrication methods and installations are the same. Every once in a while a project comes around that has special qualities. 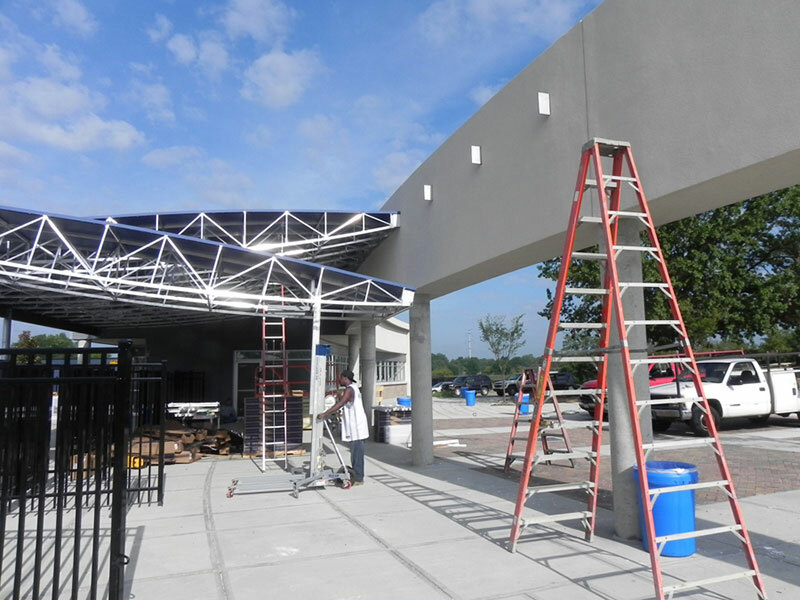 Maybe the awning would project out far enough to require a support post but the Architect does not want one or the frame can’t be attached to the building so it needs to be self supporting. 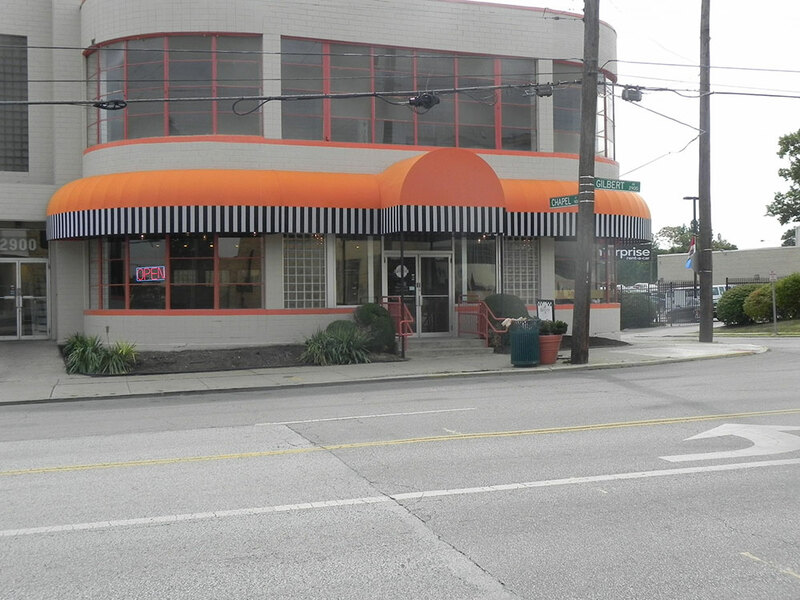 Featured Project -Giminetti Bread Co. The owners of Giminetti Bread Co.recently remodeled inside the restaurant and decided the forest green awning from the 90’s needed an update as well. 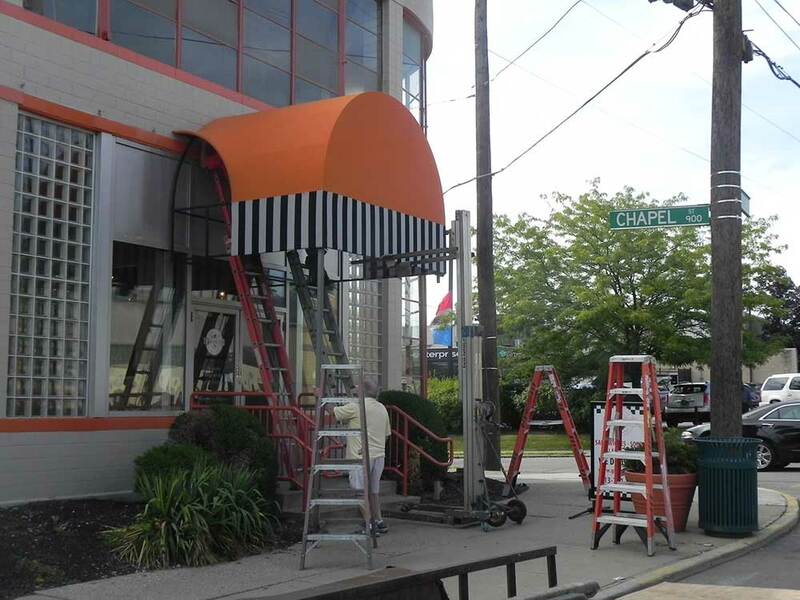 Using a combination of Sunbrella Tuscan and black and white stripe for the valance, this awning now adds a lot of visual interest and curb appeal the large building was lacking. 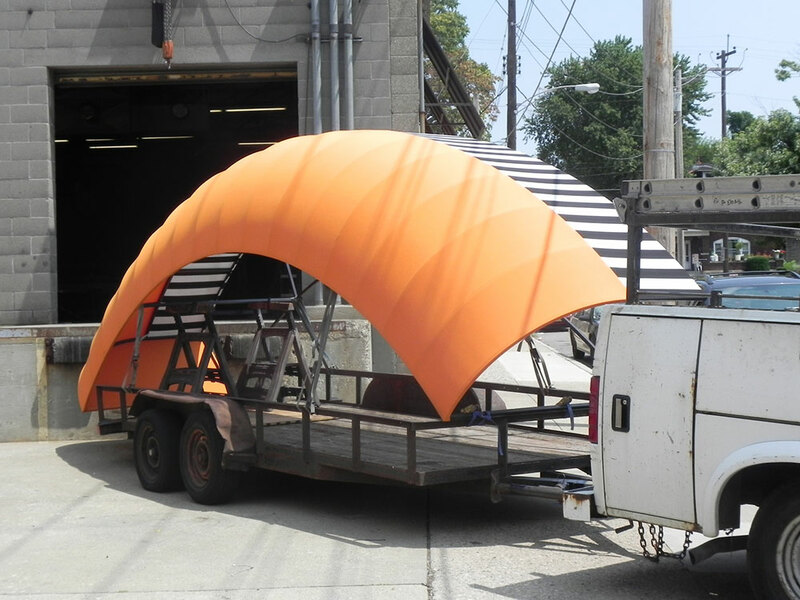 There were many challenges with this project, from rigging and transporting the large frame sections to making the striped valance look seamless. Many hours of work by our skilled craftsman made this a successful project. Hopefully it will help bring more customers into the restaurant. 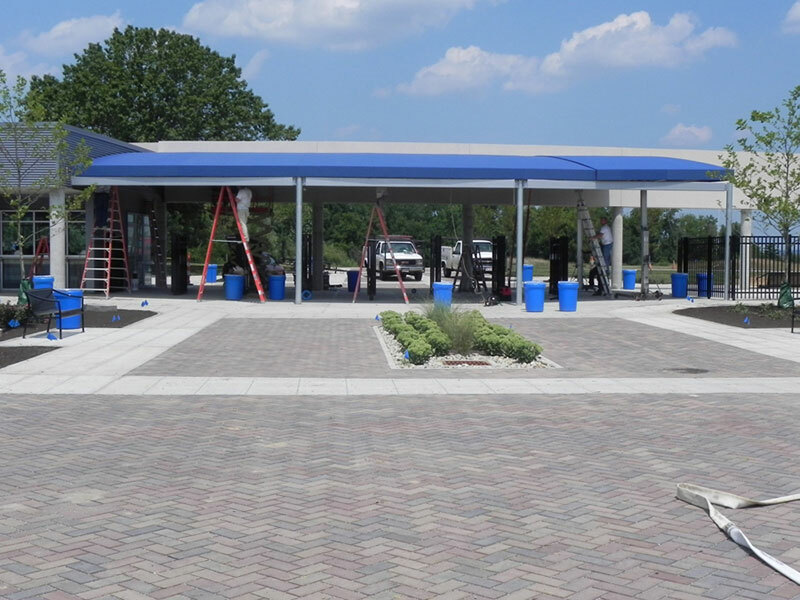 The current featured project is located at the Lindner Tennis Center in Mason, Oh. This project had so many challenges, it’s hard to believe that it was completed on time. 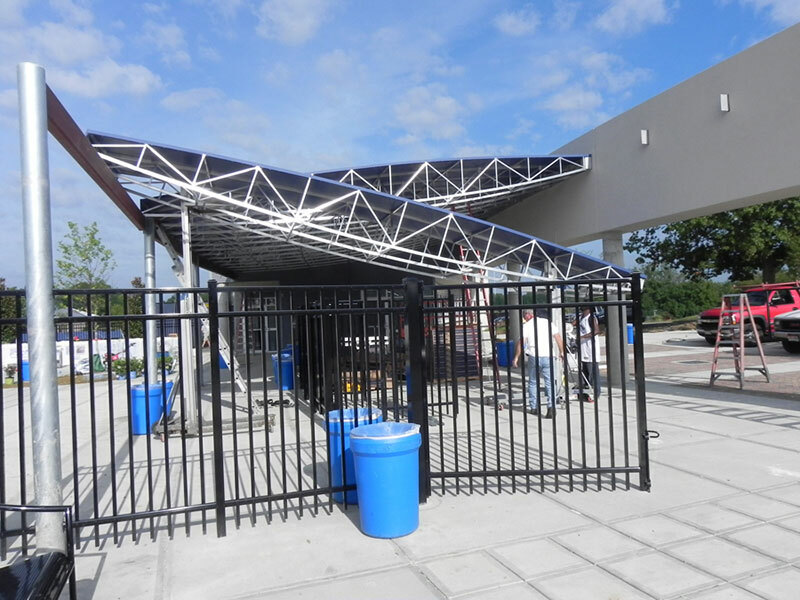 The 60 foot long x 30 foot wide canopy was mounted to a curved wall in the front and was support by a curved beam in the rear, needing to provide a 30 foot clear span. This project required a lot of design time and field measuring to figure out the details which were not provided on the Architect’s drawings. 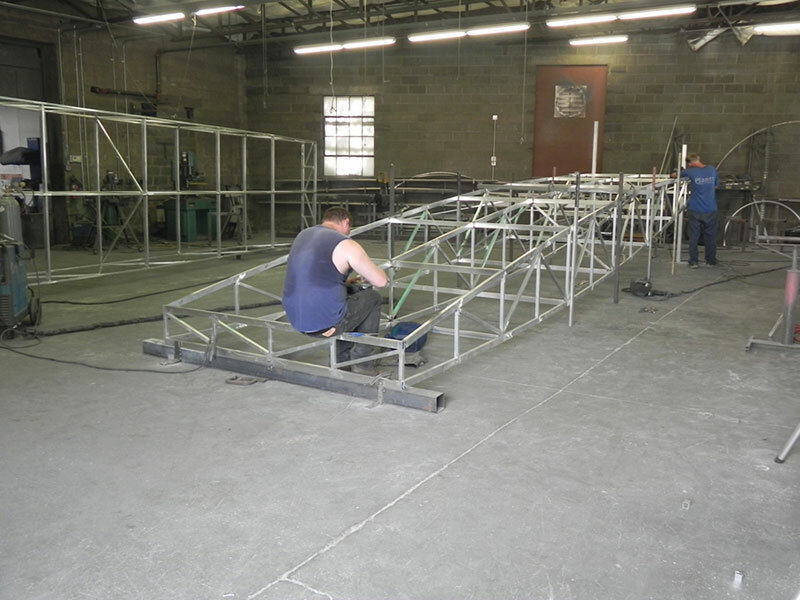 The frame had to be fabricated in sections so it could be transported to the site. 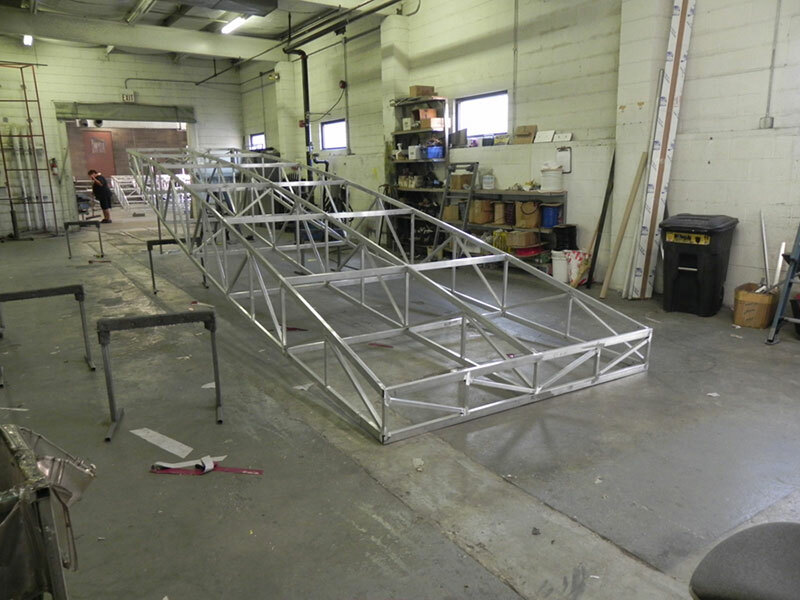 The entire frame was fabricated and assembled in the shop to make sure it was right. Once it was on site it had to fit. There was no time to fix a mistake. Each frame section had to match the curve of the support structure and hit specific mounting positions with very small tolerances. 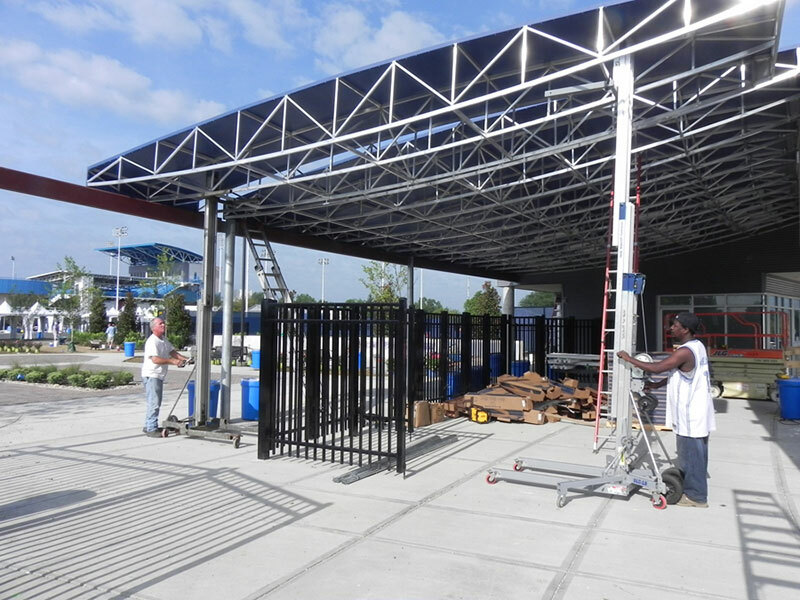 A lot of planning and great craftsmanship from the designer to the installers was needed to complete this project on time. In the end, the project took three weeks from fabrication to installation and looks great.